Members of the press have been sent invitations to a special Apple product unveiling event scheduled for next Tuesday, Oct. 22, where the company is expected to show off its latest iPad models. 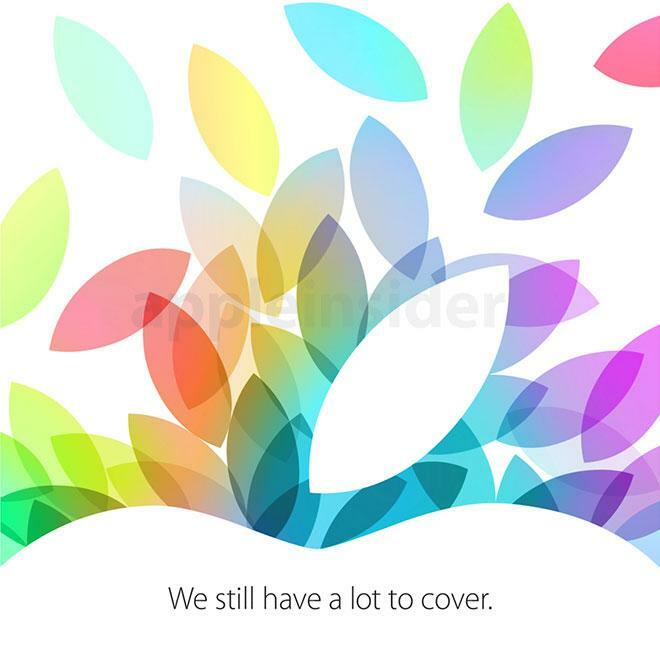 Apple's Oct. 22 event invitation. The invitation reveals that the event will be held at the Yerba Buena Center for the Arts in San Francisco, Calif. It is scheduled for 10 a.m. Pacific, 1 p.m. Eastern. The invitation features the top of the Apple logo, focusing on its "stem." In the background, multiple stem shapes are scattered about in a variety of colors. The invitation teases: "We still have a lot to cover." Word of Apple's Oct. 22 event first leaked to the media last week. Apple, as usual, waited until exactly one week before its event to send out official invitations. Though the invitation doesn't explicitly mention the iPad, it's expected that Apple will introduce two new versions of its market leading tablet lineup next week. The fifth-generation full-size iPad is expected to see an overhauled design making it look more like the iPad mini. It's likely to have thinner side bezels and a slimmer profile, allowing the device to be more portable and lightweight while retaining its 9.7-inch screen. As for the popular iPad mini, Apple is expected to overhaul the screen to be a high-resolution Retina display, matching the pixel count found on the traditional iPad but packing those pixels into a tinier 7.9-inch display. AppleInsider will be at the event in San Francisco, and will have live coverage, as well as initial impressions with any new devices. For an extensive rundown on what to expect, including new iPads, Macs, OS X Mavericks, and other potential surprises, see AppleInsider's in-depth summary.